DES MOINES, Iowa Mitt Romney made his final pitch to Iowa voters on Sunday, attacking President Obama for caring "more about a liberal agenda" than the economy and asking those who have yet to vote in a state where polls show him trailing to compare the candidates' achievements on job creation. "Do you think Obamacare created jobs?" Romney asked a crowd of more than 4,000 people who yelled back "No!" He threw out more examples, each eliciting the same response: "Did his war on coal, oil and gas create jobs? Did Dodd-Frank regulations help banks make more loans? Does raising taxes put people to work? How about his avalanche of new regulations -- did they help small businesses?" Romney pointed to his own record in both business and leading the state of Massachusetts, focusing on his efforts at reaching across the aisle to Democrats to get things done. The Obama campaign has attacked his record as governor and claims of bipartisanship, saying that he drove the state to 47th out of 50th in job creation while alienating key Bay State Democrats. "I learned as governor of Massachusetts that the best achievements are shared achievements," he told the crowd. "I learned that respect and goodwill go a long way, and they are usually returned in kind. That's how I will conduct myself as president. I will bring people together. I won't just represent one party. I'll represent one nation." The Obama campaign has attacked his record as governor and claims of bipartisanship, saying that he drove the state to 47th out of 50th in job creation while alienating key Bay State Democrats. Campaigning for Obama on Sunday in Concord, N.H., former President Bill Clinton also cited Romney's claim that his economic plan would produce 12 million new jobs. "What he forgot to tell you is this -- just a few days before that 12 million jobs promise was made, an independent business forecaster, Moody's Analytics, said to all of us that we will get 12 million jobs in the next four years if we just don't mess up what the president has already done," Clinton said. Romney is spending his final days on the campaign trail both encouraging crowds to vote and warning what he says another four years of an Obama administration will look like. He argued that the president is offering four more years of "the same course we've been on." "The same path means 20 trillion dollars in debt," Romney warned the crowd, who moaned their disapproval. "It means continued crippling unemployment. It means stagnant take-home pay. It means depressed home values and a devastated military. Unless we change course, we may be looking at another recession." He asked the Iowans to make one final push to increase the Republican turnout on election day. "Let's make sure that we get everyone we know out to vote on Tuesday. Gotta get that done!" Romney has visited the state 12 times since becoming a general election candidate - the exact number of times Obama will have visited by Election Day. With the distinction of being the state with the first-in-the-nation caucus, Iowans have found themselves inundated with campaign appearances and advertisements for more than a year and a half, leading to campaign fatigue in much of the state. The state's largest paper, The Des Moines Register, recently endorsed Romney - the first time the paper has endorsed a Republican since Richard Nixon in 1972 - saying that he offered a "fresh economic vision." But the paper's final poll, released on Saturday, shows Romney trailing President Obama by 5 points. 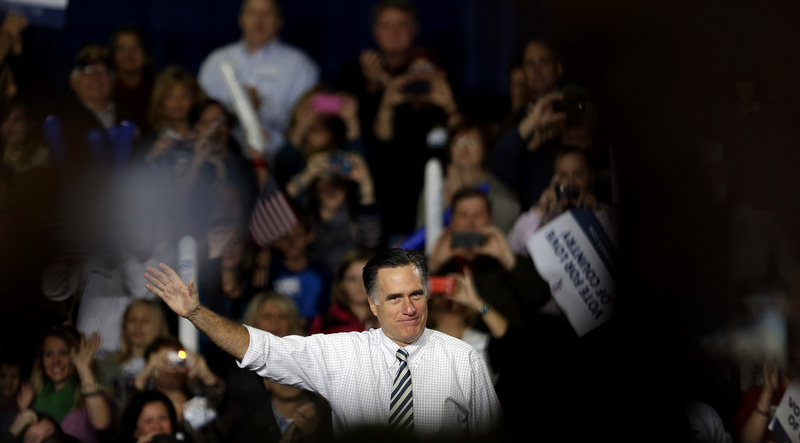 Although the poll contained good news for the president, there are bright spots for Romney. The Republican nominee is winning self-described independent voters -- many of whom have yet to vote -- by four points, 41 percent to 37 percent.